at the back of our property. and an invitation to dream. 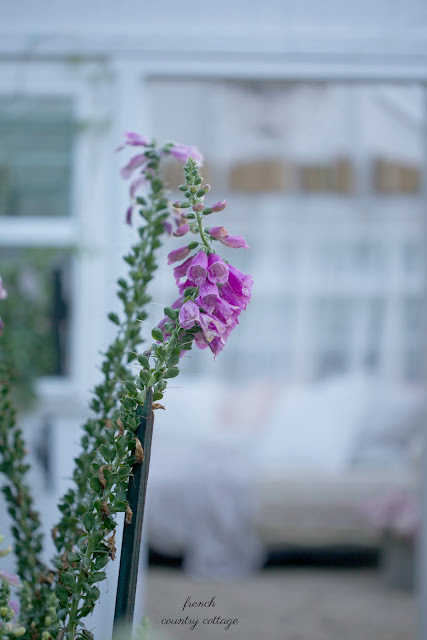 with all things pretty at home. of that amazing little play house and the hours spent there. and a bit of whimsy. I thought of what I loved. and a pretty little spot filled with abundance of flowers. And it inspired a bit of a dream spot. 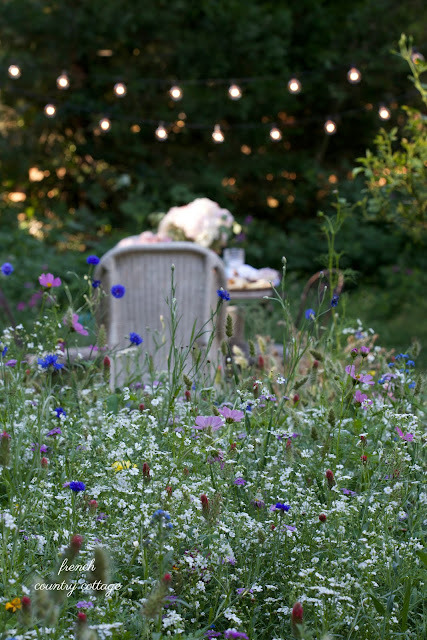 lambs ear and white roses- and a scattering of wildflowers mixed in. and led to something enchanted. like that French daybed I shared recently. And I also wanted a spot to play with flowers of course. You know... in case I ever decided that arranging flowers was my thing. I wanted lots of ambiance and simple charm - and simple styling. 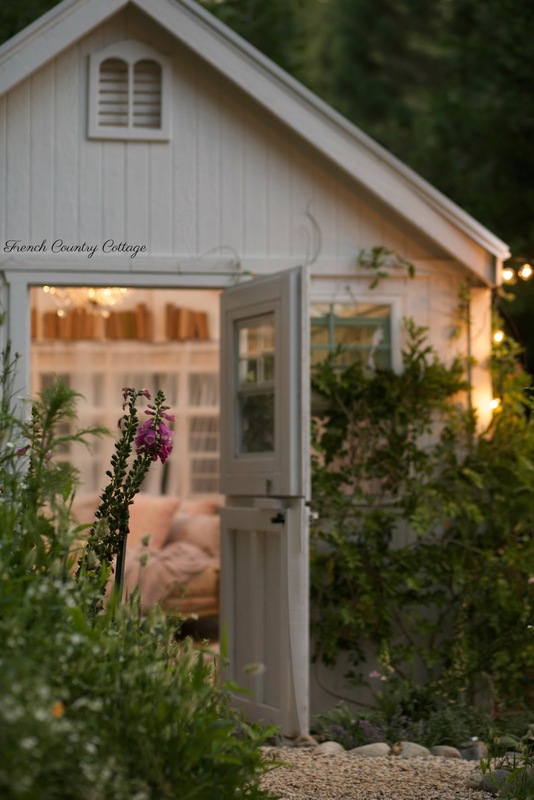 And so... putting this and that and everything else together in one..
the French Country Cottage She Shed happened. 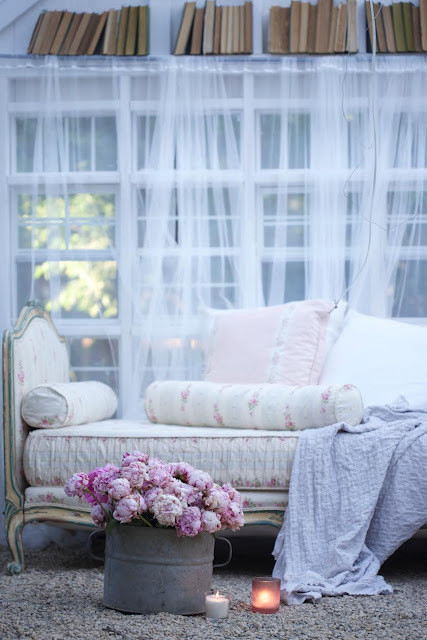 and even pretty little breezy curtains to add a bit of romance. and a whole lot of French cottage charm. And of course... twinkle lights. Because it just wouldn't feel the same without them. as well as the perennial garden. I am pretty much obsessed with how this came out. which makes it a perfect spot to sleep if it is super hot. and I will be share details and sources here in the next week or so as well. WOW, I love it. I am sure you will spend a lot of time in there. I have always wanted one, but unfortunately it never came to be. So enjoy it much and have a wonderful week - hope it's not to hot where you are. Thanks so much Mary- and I hope you have a wonderful week as well!! Okay I just have to say a couple more things. Courtney, seriously, this is so beautiful! I clicked on over to Angies List to get more detail and I'm now considering something like this for my own yard. That is awesome DeAnna! The kits are amazing- and go together so easily compared to each piece by piece. Would love to see it if you decide to add one to your home! I am so impressed with your vision! (well, duh...you have amazing taste!) What a lovely space!! Can't wait to read more about it! I'm speechless, Courtney. What a beautiful She Shed. Beautifully styled. Look forward to seeing more of this space. Such an awesome space!!! So cute and love the idea!!! 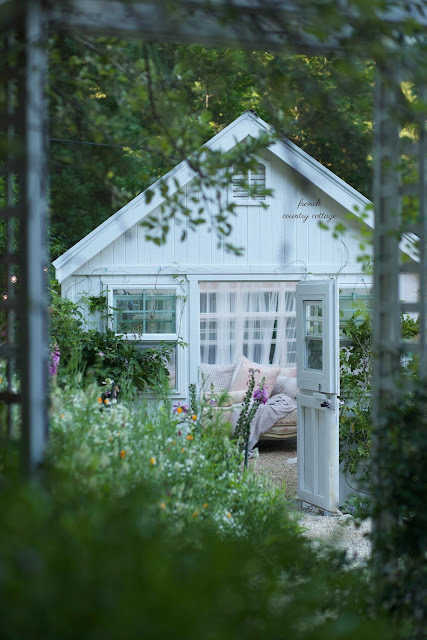 Your she shed is a perfect reflection of your style. I hope you receive much enjoyment during the hours you spend out there. Look forward to seeing more posts regarding future plans for it. Oh Courtney! This is stunning! What a dreamy spot. I think this is such an inspiring spot. Wish I had a spot to put something like this. 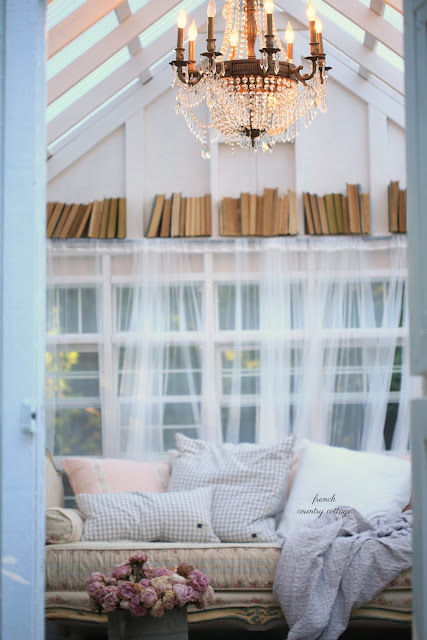 Have a wonderful day inside your beautiful She shed. Wow Courtney!!! It's enchanting and spectacular! You did a wonderful job! It's just dreamy! Courtney, your new she-shed is lovely! I can see it becoming s lovely greenhouse in the wintertime with tender plants brought indoors. A lovely, quiet place to rejuvenate! 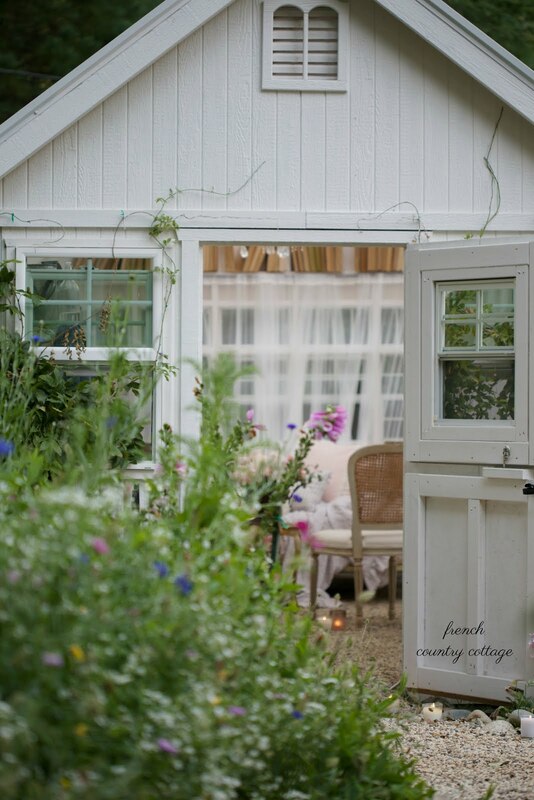 Your lovely She Shed reminds me of one I loved a long time ago by Sandra Foster at My Shabby Streamside Studio. 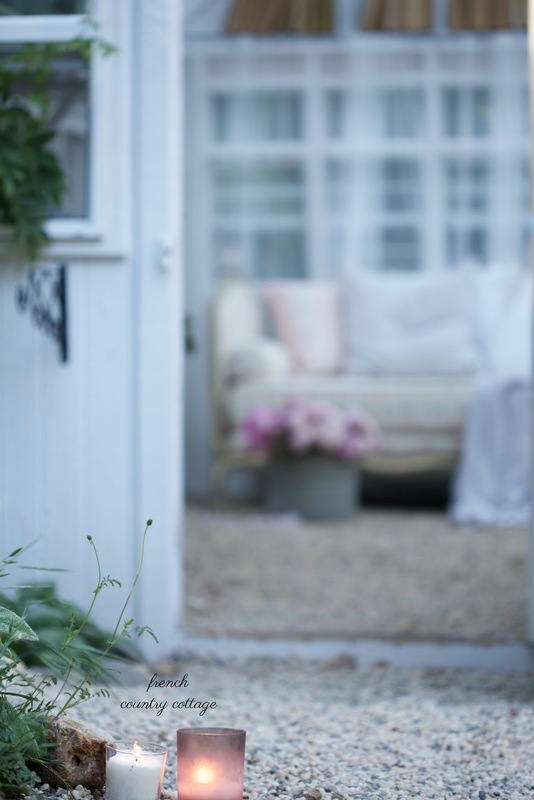 I've been dreaming of a lovely girly retreat just like that ever since. Your backward vintage books were the first thing that drew my memory - like a lovely fragrance brings back memories. I'm really loving your dutch door too. You live a charmed life, my dear. This she-shed takes the cake. LOVE it! Omgosh Courtney when I was looking at this I thought you were just posting about something you liked that you saw on pinterest. OMgosh then I went to angles list and saw the how to and then I re-read your post and I finally realized this was your project. Omgosh I am so loving this. I want to do this! Magical. I love it. Though I've followed your blog for years and still do, I must admit I rarely comment. I love your blog, your exquisitely romantic home and guest cottage, and then this. Your so-called "She-shed" to my sensibilities, makes your property a true "Shangri-la. Courtney, I'm pretty sure you've worked very, very, very hard over the years to have reached this point in your life. Heartfelt congratulations. Please enjoy all you've accomplished. I'm truly delighted reading about and seeing all the steps in the process that you can share on your "must follow" blog. I love it! Thank you for sharing. Your grown up "playhouse" is breath taking. I would say you nailed your vision and then some. I am curious about the pea pebble floor. 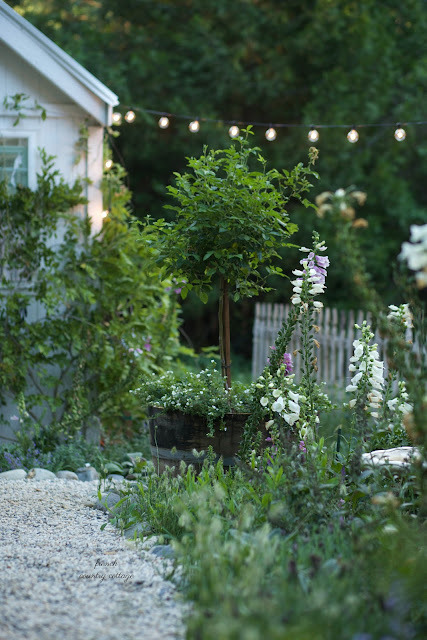 I love the look, texture, and the idea of nestling buckets of flowers and candles in it. 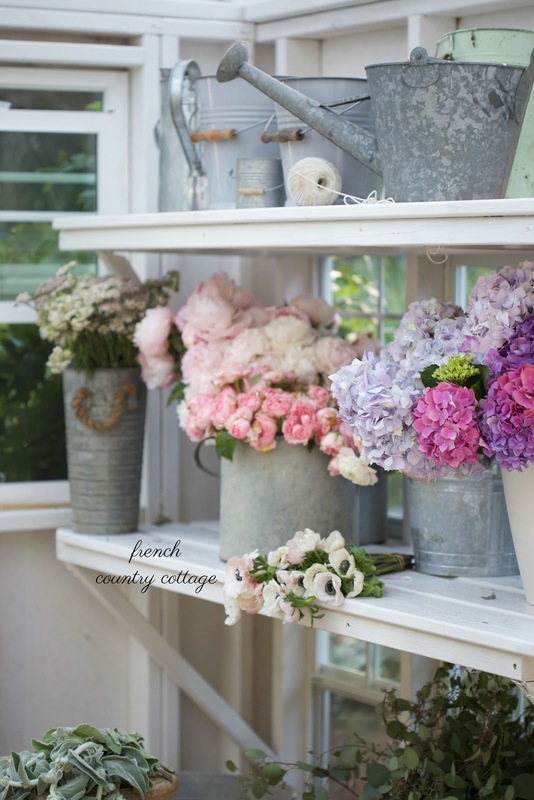 How have you resolved the practicality of weather with all of your pretty things? This my first viewing of your blog. I will be back! Thanks for sharing. Courtney, I love your She Shed. It's absolutely dreamy! I would like to share a link to this post in my new monthly feature, "Second Tuesday Art Walk." I would also like to include one of your photos of your she shed if you would grant me permission. Please let me know, and thanks! 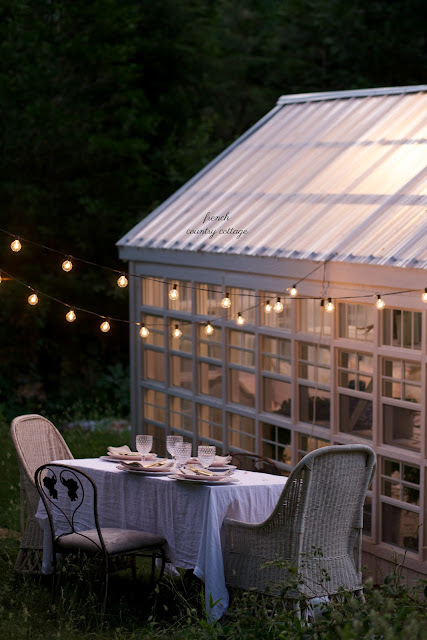 Cute shed. I had one built for me a few years ago but I call mine " The Menopause Cave". I actually can live in mine if need be. It is actually a tiny house on wheels. It's filled with several chandeliers and fluffy beds and pillows. She sheds are so sweet. I also have written about being inspired by my childhood playhouse. Our dads probably would of never guessed we adults still love tiny spaces. As a little girl my sisters and I played in a ice fishing shack that was given to my dad. We had so much fun and had slumber parties in the summer. What scary stories we told. Just because we get older doesn't mean we can't enjoy our shacks now. Yours is so Classy and so very elegant. I'm so in love with your French Daybed!! I don't think I would ever leave your beautiful She Shack. Your personality is so apparently feminine, sophisticated and elegant. One to truly cherish!! Who makes this pre fab shed? Every girl's dream room. Is the prefab size adjustable? One day, one day.